Located along the Ouachita River in downtown Monroe, Louisiana. Your Destination for Shopping, Art, & Entertainment! Hello, I am Jamie Mayo, mayor of the city of Monroe. 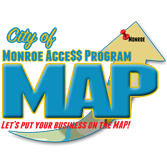 On behalf of the city council we are truly honored that you have chosen to visit the website of our unique city, where "We Are Monroe Proud". The heart of Monroe, found in the people who live here, makes, it a beautiful and exciting place to visit or live. Monroe is an economic, educational, and medical hub for Northeast Louisiana, you will find it to be a very diverse area that anyone can get accustomed to. You still have time to get your team together, registered and geared up for action this Saturday.